The snub disphenoid is pictured at left. I do not know why it is called that, and I ought to know, because I am the principal author (so far) of the Wikipedia article on the disphenoid. Also, I never quite figured out what "snub" means in this context, despite perusing that section of H.S.M. Coxeter's book on polytopes at some length. It has something to do with being halfway between what you get when you cut all the corners off, and what you get when you cut all the corners off again. Anyway, earlier this week I was visiting John Batzel, who works upstairs from me, and discovered that he had obtained a really cool toy. It was a collection of large steel ball bearings and colored magnetic rods, which could be assembled into various polyhedra and trusses. This is irresistible to me. 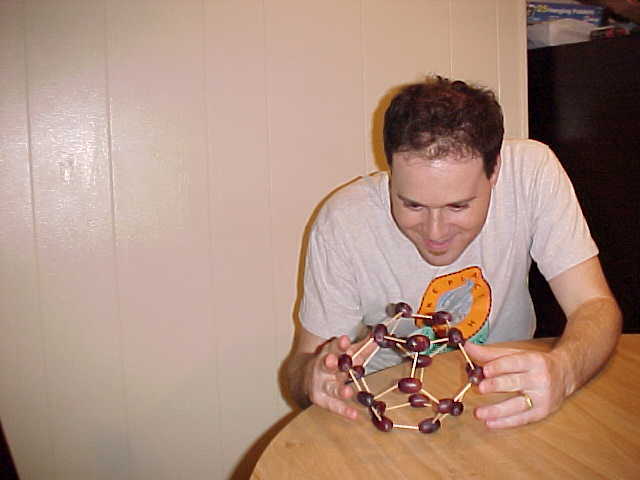 The pictures at right, taken around 2002, show me modeling a dodecahedron with less suitable materials. The first thing I tried to make out of John's magnetic sticks and balls was a regular dodecahedron, because it is my favorite polyhedron. (Isn't it everyone's?) This was unsuccessful, because it wasn't rigid enough, and kept collapsing. It's possible that if I had gotten the whole thing together it would have been stable, but holding the 50 separate magnetic parts in the right place long enough to get it together was too taxing, so I tried putting together some other things. A pentagonal dipyramid worked out well, however. To understand this solid, imagine a regular pyramid, such as the kind that entombs the pharaohs or collects mystical energy. This sort of pyramid is known as a square pyramid, because it has a square base, and thus four triangular sides. Imagine that the base was instead a pentagon, so that there were five triangular sides sides instead of only four. Then it would be a pentagonal pyramid. Now take two such pentagonal pyramids and glue the pentagonal bases together. You now have a pentagonal dipyramid. The success of the pentagonal dipyramid gave me the idea that rigid triangular lattices were the way to go with this toy, so I built an octahedron (square dipyramid) and an icosahedron to be sure. Even the icosahedron (thirty sticks and twelve balls) held together and supported its own weight. 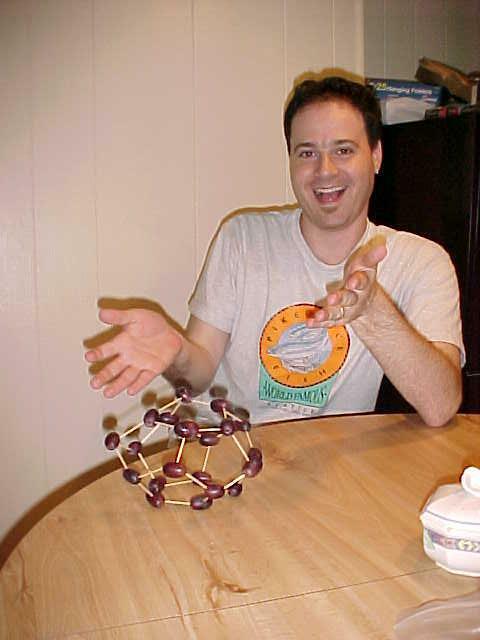 So I had John bring up the Wikipedia article about deltahedra. A deltahedron is just a polyhedron whose faces are all equilateral triangles. When I was around eight, I was given a wonderful book called Geometric Playthings , by Jean J. Pedersen and Kent Pedersen. The book was in three sections. One section was about Möbius strips, with which I was already familiar; I ignored this section. The second section was about hexaflexagons, with examples to cut out and put together. The third section was about deltahedra, again with cutout models of all eight deltahedra. As an eight-year-old I had cut out and proudly displayed the eight deltahedra, so I knew that there were some reasonably surprising models one would make with John's toy that would be likely to hold together well. Once again, the deltahedra did not disappoint me. Four of the deltahedra are the tetrahedron (triangular pyramid, with 4 faces), triangular dipyramid (6 faces), octahedron (square dipyramid, 8 faces), and pentagonal dipyramid (10 faces). Another is the icosahedron. Imagine making a belt of 10 triangles, alternating up and down, and then connect the ends of the belt. The result is a shape called a pentagonal antiprism, shown at left. The edges of the down-pointing triangles form a pentagon on the top of the antiprism, and the edges of the up-pointing triangles form one on the bottom. Attach a pentagonal pyramid to each of these pentagons, and you have an icosahedron, with a total of 20 faces. The other three deltahedra are less frequently seen. One is the result of taking a triangular prism and appending a square pyramid to each of its three square faces. (Wikipedia calls this a "triaugmented triangular prism"; I don't know how standard that name is.) Since the prism had two triangular faces to begin with, and we have added four more to each of the three square faces of the original prism, the total is 14 faces. Another deltahedron is the "gyroelongated square dipyramid". You get this by taking two square pyramids, as with the octahedron. But instead of gluing their square bases together directly, you splice a square antiprism in between. The two square faces of the antiprism are not aligned; they are turned at an angle of 45° to each other, so that when you are looking at the top pyramid face-on, you are looking at the bottom pyramid edge-on, and this is the "gyro" in "gyroelongated". (The icosahedron is a gyroelongated pentagonal dipyramid.) I made one of these in John's office, but found it rather straightforward. The last deltahedron, however, was quite a puzzle. 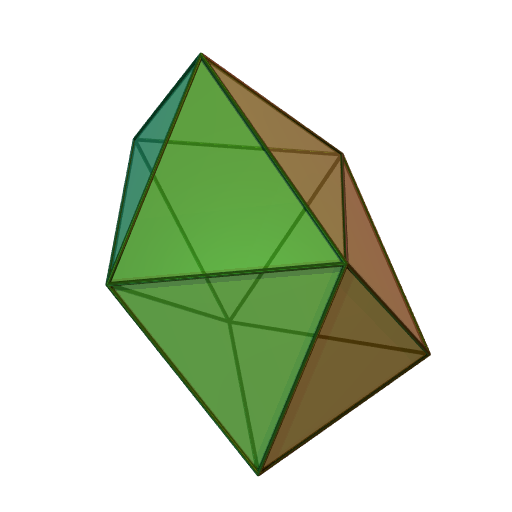 Wikipedia calls it a "snub disphenoid", and as I mentioned before, the name did not help me out at all. It took me several tries to build it correctly. It contains 12 faces and 8 vertices. When I finally had the model I still couldn't figure it out, and spent quite a long time rotating it and examining it. It has a rather strange symmetry. It is front-back and left-right symmetric. And it is almost top-bottom symmetric: If you give it a vertical reflection, you get the same thing back, but rotated 90° around the vertical axis. When I planned this article I thought I understood it better. Imagine sticking together two equilateral triangles. Call the common edge the "rib". Fold the resulting rhombus along the rib so that the edges go up, down, up, down in a zigzag. Let's call the resulting shape a "wing"; it has a concave side and a convex side. Take two wings. Orient them with the concave sides facing each other, and with the ribs not parallel, but at right angles. So far, so good. To make the snub disphenoid, you do stick eight triangles in between the two wings, but the eight triangles do not form a rhombic antiprism. Even supposing that such a thing exists. I hope to have some nice renderings for you later. I have been doing some fun work in rendering semiregular polyhedra, and I am looking forward to discussing it here. Advance peek: suppose you know how the vertices are connected by edges. How do you figure out where the vertices are located in 3-space? The two wings here are ABCD and EFGH. We can distinguish three sorts of edges: five inside the top wing, five inside the bottom wing, and eight that go between the two wings.